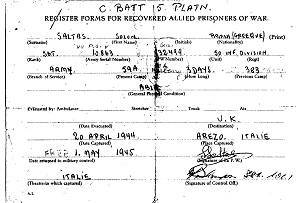 My father Solomon Saltiel (aka Solon Saltas) was a POW in Stalag VII A during the later part of the war. 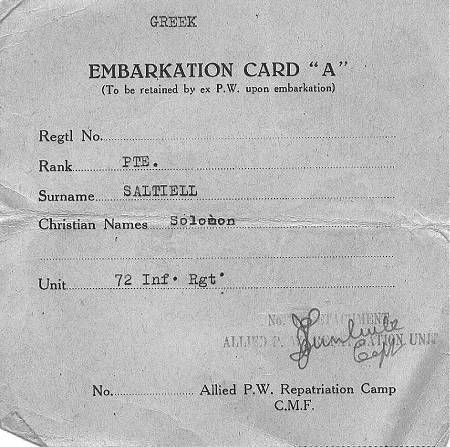 He was a Greek POW who was captured by the Italians in Albania in 1941. He was sent to Bergamo in Italy and then to an officer's camp at Poppi near Florence. He was not an officer but sent as an interpeter since he spoke Italian fluently as well as French, Greek, and Spanish. Poppi was minimum security and he escaped several times to the hills where local farmers befriended and hid him. Eventually the Germans took over the camp and he was sent to Stalag VII A by train. 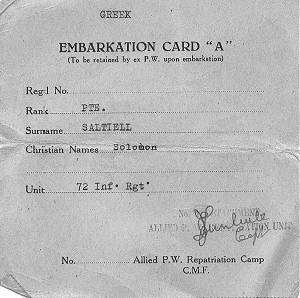 My father did not stay with the Greeks in Stalag VII A as he was used as an interpeter. He lived with the British officers and communicated with them in French. This is a photo of him along with his close friends. 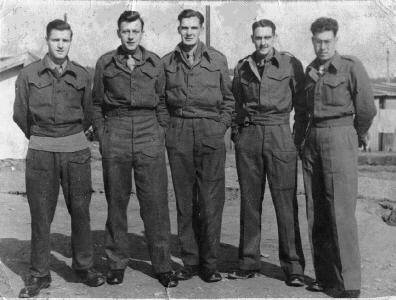 Left to right: Jim Gordon, George Atwell, Robert Douglas, Lefe ?, Solomon Saltiel. I believe the photo was taken at Stalag VII A after the liberation. 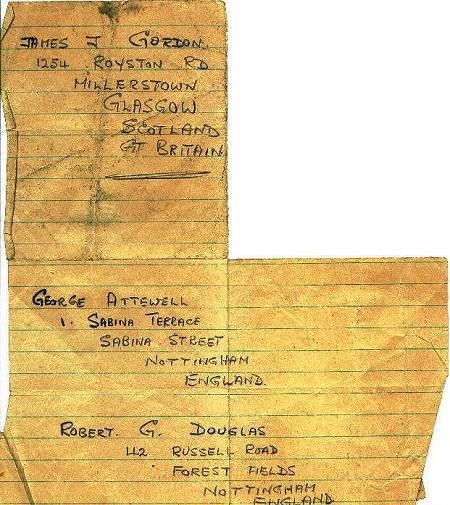 This is a copy of a paper from Stalag VII A containing the addresses of my father's British friends that he kept all of these years. He described one occasion when they would trade with the Russians at an area between fences. He told me that, by hand signals, he bargained a trade with a Russian - cigarettes for potatoes. The Russian threw the potatoes to him and he threw the cigarettes back. Being light, they fell short of the fence and as the Russian tried to reach them, he was shot. My father described the camp as a city in itself with its own government. The British protected him and gave him false papers so that the Germans would not find out he was Jewish. His name was Solomon Saltiel, but he went as Solon Saltis. I grew up listening to his stories, the lack of food, the camaradarie, and the bad times. He would have been thrilled to see the map of the camp and read about it. He was an avid war historian and passed it on to me. Unfortunately he died two years ago. Seeing your website was a great pleasure for me. 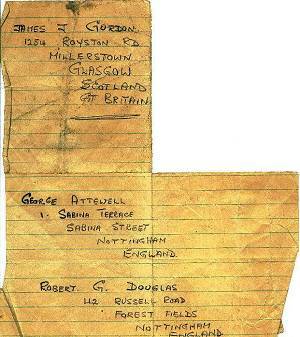 This is a copy of the embarkation card my father recieved when he left Stalag VII A for England. 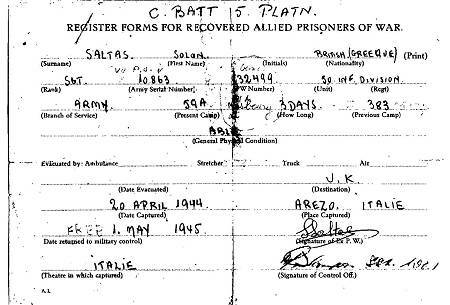 A copy of the register form for recovered allied POWs. My father's POW number was 132499. I would be honored, and I am sure he would, to have his story posted on your site. The war was the best of times and the worst of times for him. His experiences gave him an appreciation for life and for the freedom we all take for granted. It also gave him an opportunity to make some enduring friendships. Last update 22 June 2001 by © WebTeam Moosburg (E-Mail) - All rights reserved!